Will you control the roll? 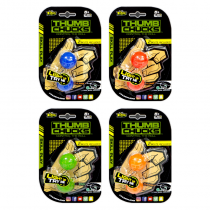 Thumb Chucks is the skill toy that can create endless trick combos. Portable and lightweight, Thumb Chucks enable you to practice anywhere – at the beach, walking down the street, or at home. Change the colours and create your own preferred set of Thumb Chucks to suit your personal style.